After a day at the beach, nobody wants to climb into a car with feet and toes coated in sand. 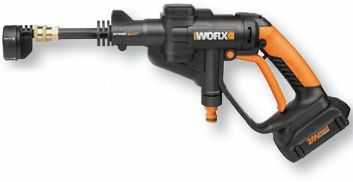 Enter the WORX Hydroshot. Sure, the first truly portable pressure washer was built to tackle bigger jobs, but “for sun-worshipping neat freaks, this rechargeable power cleaner is a game changer.” Pull the trigger and it unleashes a spray up to five times more powerful than a garden hose’s, enough to “blast every last grain of sand off your feet, beach gear, and delighted offspring.” You can add a bottle attachment or just use a hose drawing water from a bucket.